However, you might wonder if the reasons are right for you. You might wonder if buying a Rolex is a good investment. Or, maybe what type of Rolex would be best for you. Also, whether you can actually afford such a fine watch? These are, of course, all valid questions when considering making such a purchase. Buying a Rolex, whether new Rolex or a pre-owned Rolex, might seem a bit daunting, if not completely overwhelming if you know very little about watches. The first step in choosing the right Rolex is by setting a budget. Now, not all Rolex watches will set you back $10,000 or $20,000, in fact, you will find several models under $5,000. Now, you will have a greater choice of timepieces if you are in the market for a pre-owned Rolex. Regardless of the monetary limitations you set, realize that purchasing any Rolex is a good investment. And buying a used Rolex is a very wise option when you initially enter this type of market. The resale strength is one of the reasons pre-owned Rolexes bring good returns. One reason this holds true is because there are a lot of owners who decide to trade up their watch to a different model, so there are certainly deals to be made. You can view owning a Rolex watch in several ways. There are some people who see wearing a Rolex as a status symbol while others wear them due to the achievements of the company. But you might be buying a Rolex simply because they are one of the best products in the industry. Start your Rolex search today by visiting our website for great deals on pre-owned Rolex watches. While yellow gold and white gold versions of the Rolex Day Date President watches are common, the rose gold editions are a little more elusive. In fact, the Swiss watchmaker even stopped making rose gold Rolex Day Date President watches for a while. Thankfully, Rolex brought them back, and we’re sure glad they did. Not as flashy as yellow gold and not as understated as white gold, rose gold happily sits in the middle emitting its warm and unique glow. Rose gold watches for men have been very fashionable for quite some time now. That distinct precious metal coupled with the timeless aesthetics of the Rolex President makes for an attractive ultra luxury watch indeed. So with that, let’s dig into the details of the rose gold Rolex Day Date President watch and find out what Everose actually is. Before we get to the watches, let’s talk gold. 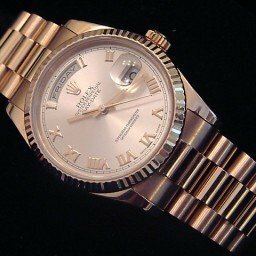 If you’ve spent any time reading up on Rolex literature or browsing their website, you’ll see the term Everose gold used instead of rose gold. But what exactly is Everose you ask? 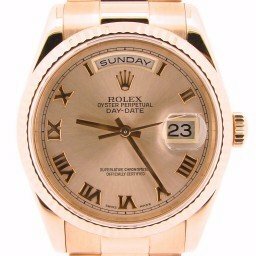 Not satisfied with just regular 18k rose gold, Rolex came up with their own formula and presented it to the world in 2005. Named Everose, the Rolex patented pink gold alloy includes the perfect blend of gold, copper, and platinum to give its everlasting color. In fact, Rolex dubbed the metal Everose because it’ll never fade—forever rose. While there are some vintage rose gold Rolex Day Date President models, they are quite rare so we’d like to focus our attention on more contemporary models. As mentioned, Rolex didn’t produce rose gold President timepieces for a while. For example, there are no rose gold versions of the ref. 18xxx. But in 2000, Rolex revived the rose gold Day Date to the delight of watch fans everywhere. 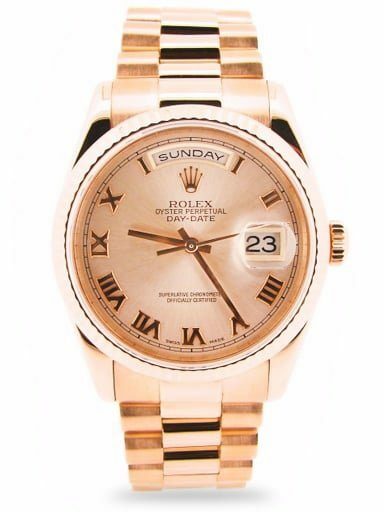 Today, the two main Rolex President mens rose gold Day Date 36 watches are the ref. 118235 and the ref. 118205. The first one includes a fluted bezel and the latter a smooth bezel. Both versions sport the traditional 36mm sized Oyster case and the solid 18k rose gold President bracelet. There is, however, the option to get the rose gold Day Date 36 on the sportier Oyster bracelet too. In true Rolex fashion, there’s a wide range of dial choices. There are different colors, different types of hour markers, and of course, gem options too. There are even material alternatives from metal to meteorite to mother-of-pearl. Pre-2005, the President ref. 118235 and the President ref. 118205 are constructed using 18k rose gold while post-2005 they boast the new Everose material. If you’re looking for a larger version of the classic 36mm sized Rolex President, there are two different models to choose from. There’s the (now discontinued) Day-Date II, which made its debut in 2008 and exited in 2015. The Everose gold Day-Date II ref. 218236 dons a generous 41mm Oyster case, wider lugs, and a broader shape for the heftiest Rolex President option to date. In 2015, Rolex slimmed down the larger President model with the launch of the new Everose gold Day-Date 40 ref. 228235 with a 40mm Oyster case adorned with a fluted bezel and thinner lugs. There’s also the more precious Day-Date 40 ref. 228345RBR with a diamond-set bezel. There’s really no denying the appeal of a pink gold Rolex President. It’s precious, it’s distinct, and it’s prestigious. So, for a touch more brightness in your life, forget the rose-colored glasses and opt for a rose gold Rolex Day Date President watch instead!  In addition, we welcome you to shop BeckerTime for more elegant selections of used Rolex President mens timepieces.